VADODARA, India (Thomson Reuters Foundation) - As India moves to ramp up investment in solar power, it is exploring innovative places to install solar plants, including across the top of canals. Last weekend, U.N. Secretary General Ban Ki-moon inaugurated a new "canal-top" solar energy plant in Vadodara district in India's western state of Gujarat. "I saw more than glittering panels – I saw the future of India and the future of our world," said Ban. "I saw India's bright creativity, ingenuity and cutting-edge technology." Experts identify two major advantages in building solar plants atop canals: efficient and cheap land use, and reduced water evaporation from the channels underneath. Earlier this month, India showed it is serious about expanding energy production from renewable sources. Prime Minister Narendra Modi upped the country's investment target for solar alone to $100 billion, saying India would scale up solar power to over 10 percent of its total energy mix by 2022. As part of that effort, the Ministry of New and Renewable Energy plans to create 100 megawatts (MW) of capacity from grid-connected solar photovoltaic (PV) power plants built on top of canals and on their banks by the end of the government's latest Five Year Plan in 2017. The ministry will subsidize 30 percent of estimated expenditure of $154 million to construct facilities to meet the canal-top goal. The 10 MW plant on the outskirts of Vadodara city, which began generating power in November, is built across 3.6 km of irrigation canal, and has 33,800 solar panels mounted on steel scaffolding. Connected to the state grid, its output is intended mainly to meet demand from irrigation pumping stations. On a sunny day, the plant generates 50,000 units of electricity (1 unit equals 1 hour of 1,000-watt usage), and is scheduled to produce 16.2 million units in its first year, declining 1 percent annually as the panels degrade. A quarter of the PV panels for the plant were procured from India, with the rest imported from China. Completed in under six months, the plant's $18.3 million cost - including 25 years of operation and maintenance - is recoverable in 13 years, according to Umesh Chandra Jain, chief engineer with Sardar Sarovar Narmada Nigam Ltd (SSNNL), the Gujarat government agency that administers this facility and another smaller one. The cost of producing 1 unit of electricity at the plant is 6.5 rupees ($0.105). SSNNL is entitled to use the same amount of power it feeds into the grid without paying the standard price of Rs7.5 to Rs8 per unit, Jain said. Engineer Navin Reddy with Hyderabad-based Megha Engineering & Infrastructures Limited (MEIL), which constructed the plant, said canal-top plants are more expensive to maintain. But the company incorporated side bars on the scaffolding and walkways between the panels so they can be reached easily for cleaning. The 10 MW plant follows another smaller plant in Gujarat, commissioned in April 2012, 45 km from the state capital Ahmedabad. Set up along a 750-metre stretch of canal, the 1 MW plant has so far generated 4.35 million units of electricity. The plants are part of the Sardar Sarovar project, a hydropower and irrigation scheme that aims to water 1.8 million hectares (4.45 million acres) of land in Gujarat and Rajasthan through 75,000 km of canal yet to be completed. Both the solar power plants are built on branches of the main canal, though which irrigation water runs from a dam on the Narmada River. According to SSNNL, the 10 MW plant has saved on 16 hectares of land, and will potentially prevent 90 million liters of water from evaporating each year. In general, Jain noted that lower temperatures due to the water body below the canal-top plants boost panel efficiency by around 7 percent. But the higher construction cost of these plants – because of the use of more structural steel – is a disadvantage, said Anand Upadhyay, associate fellow with The Energy and Resources Institute (TERI) in Delhi. The 1 MW canal-top plant cost $2.8 million, according to SSNNL, whereas a 1 MW land-based solar plant costs $2.3 million. Another problem is that PV panels are usually mounted facing southwards for optimal performance, but a canal might curve and change direction. Using only north-south stretches of water could limit the scale of canal-top plants, Upadhyay said. Long-term exposure to environmental stresses and ingress of water into the panels could reduce their performance, he added. Further concerns center on the potential environmental impacts of canal-top plants on their surroundings, as the risks remain unclear. For example, Upadhyay said canal water could be contaminated by chemicals used on the plant’s scaffolding for maintenance. But SSNNL engineer Tejas Kedariawho said such fears may be unfounded because the canal water is flowing, not stagnant. Others have raised questions about keeping long stretches of PV panels secure. MEIL's Reddy said 18 CCTV cameras fixed along the length of the Vadodara plant are monitored 24 hours in control rooms, while patrol vehicles are also in operation. 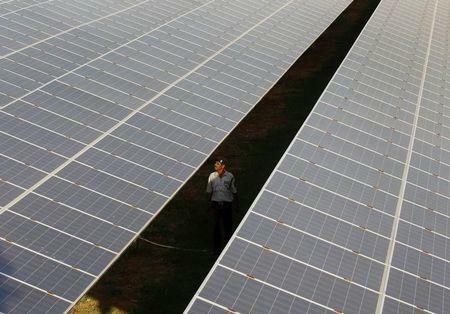 Solar power is mooted to be on the agenda when U.S. President Barack Obama visits India in the last week of January. India's prime minister is expected to make a strong pitch for U.S. investment in climate-smart technologies in India, particularly in the solar sector.